This little project is just a Q&A for my characters that I created. This was inspired by The Ask The Sonic Heroes series on Youtube so it's gonna work similar to that. Somebody ask a specific character a question and the character answers. So try to aim for that when your auditioning. Oi! You trying to start something with me?! I'll make you regret it! You mind giving me some space? I can't focus with you staring at me like that. It's annoying. Wait!! Is that the new virtual hoverboard that just came out? Oooh and they have the electromagnetic dual blades too!! 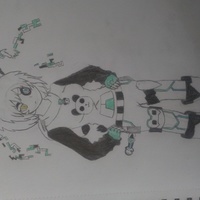 Oh this is everything a panda girl can ask for.....what? I like digital stuff and technology alright!